What Does Code P0130 Mean? When you discover a P0130 trouble code stored in your vehicle, it means that the powertrain control module (PCM) has detected a signal voltage input from the upstream (pre catalyst) oxygen (O2) sensor for engine bank one that is inappropriate for a predetermined set of circumstances, during a certain time frame. Bank 1 is the bank of the engine that contains the number one cylinder. Sensor one is always the upstream or pre catalyst O2 sensor. The O2 sensor was invented by Robert Bosch during the 1960s and most, modern, OBD-II equipped automobiles continue to utilize sensors that are either manufactured directly by the Bosch Corporation or mimic the Bosch design. At the heart of the O2 sensor is a zirconium dioxide sensing element enclosed within a vented steel housing. The sensing element is connected (usually with platinum electrodes) to wire leads in the O2 sensor wiring harness. The connector at the end of the O2 sensor wiring harness is connected to the engine control (controller area network) harness which provides the PCM with real-time data pertaining to the percentage of oxygen in the engine exhaust compared to the oxygen content of ambient air. 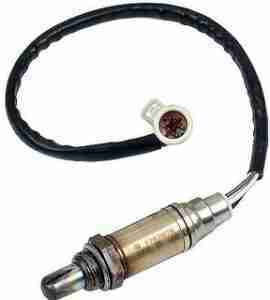 The upstream O2 sensor is designed to be inserted directly into the exhaust pipe, before the catalytic converter. The most popular and efficient method of accomplishing this is by threading the sensor directly into a threaded boss that is manufactured into the exhaust pipe. The threaded boss is positioned at the most convenient position and angle for the sensing element and vented steel housing to be inserted. Removal and installation of threaded oxygen sensors will often require specially designed wrenches and sockets, depending upon vehicle application. Several automakers also use studs welded to the exhaust pipe to secure the sensor so that the sensing element and vented steel housing are inserted into the pipe. 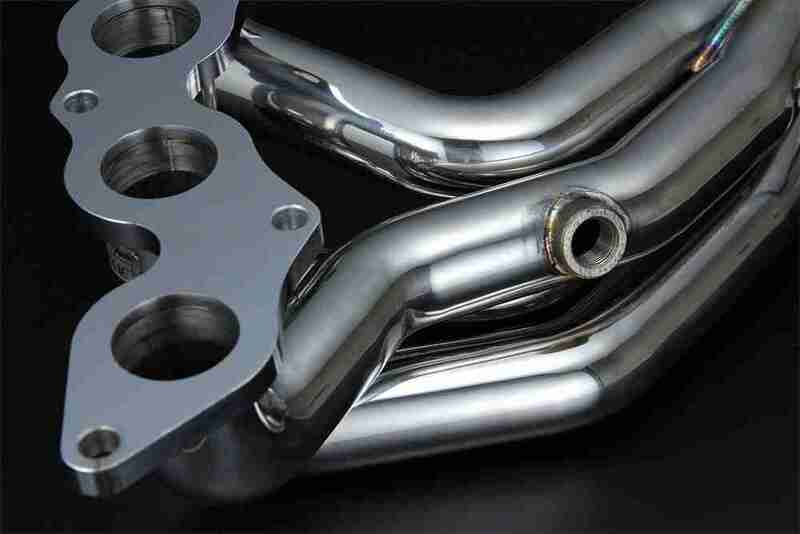 Spent engine exhaust gases are pushed through the exhaust manifold and into the exhaust pipe where they pass over the upstream O2 sensor, before reaching the catalytic converter. Exhaust gases flow through specially designed vent holes in the steel housing and across the sensing element. Ambient air is drawn into a small chamber in the center of the sensor, through the wire lead openings. In the small chamber it is heated, forcing the ions to produce (energy) voltage. Variations between the concentration of oxygen molecules in the exhaust and the ambient air (drawn into the O2 sensor) cause the concentration of the oxygen ions (inside the sensor) to fluctuate. These fluctuations cause the oxygen ions inside the O2 sensor to reposition from one platinum layer to the other infinitely. The surging oxygen ions cause changes in voltage as they move between platinum layers. These changes in voltage are recognized by the PCM as variations in exhaust oxygen concentration and reflect whether the engine is running lean (too little fuel) or rich (too much fuel). 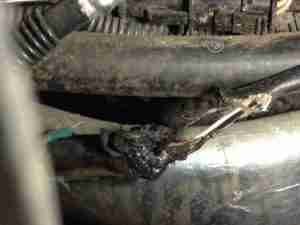 When more oxygen is present in the exhaust (lean condition) the voltage signal output from the O2 sensor is lower. When less oxygen is present in the exhaust (rich condition) the voltage signal output is higher. This data is used by the PCM to help calculate fuel delivery strategy and ignition timing, among other things. As far as I know, all O2 sensors that are currently used in OBD-II automotive applications are of the heated variety. Battery voltage is used (as soon as the engine is started) to heat the sensing element so that it can begin providing the PCM with accurate input data more quickly. The heater element passes through the sensing element and is attached to O2 sensor harness wiring with platinum electrodes that resist extreme temperatures created by exhaust gases. The P0130 code does not pertain to the heater portion of the sensor but O2 sensor heater failure can contribute to actual O2 sensor circuit malfunctions. Upstream O2 sensors typically fluctuate regularly between 100 and 900 millivolts (.1 and .9 volts), when the engine is idling in closed loop operation. As long as the engine remains in closed loop operation, the PCM considers input signals from upstream O2 sensors to regulate fuel delivery. Once the engine enters open loop operation (during conditions like wide open throttle), fuel delivery strategy is preprogrammed. Once the engine enters closed loop operation, if the PCM detects too much inactivity in the O2 sensor circuit or voltage input readings that do not correspond with current conditions, a P0130 code will be stored and a malfunction indicator lamp should be illuminated. What are the common causes of code P0130 ? What are the symptoms of code P0130 ? How do you troubleshoot code P0130 ? A diagnostic scanner, digital volt ohmmeter (DVOM), a wiring diagram, and O2 sensor system connector face views will be helpful in diagnosing a code P0130. All Data is an excellent source of system wiring diagrams and other application specific information. Make sure that the engine is running efficiently before attempting a diagnosis for this code. Ignition misfire codes, throttle position sensor codes, manifold air pressure code, and mass air flow sensor codes should be addressed before attempting to diagnose this code. I tend to begin my diagnosis with a visual inspection of all system wiring harnesses, connectors, and components. In the case of a P0130, I would pay special attention to harnesses that are routed near hot exhaust pipes and manifolds, as well as those that are routed near sharp (cylinder head) edges or porous surfaces. Incorrectly routed harnesses should be routed correctly and secured away from hot exhaust (nylon tie wraps work well for this). I would also test battery voltage, battery terminal ends, and alternator output. Make repairs as needed and retest the system. I would then connect the scanner to the diagnostic port and retrieve all stored trouble codes and freeze frame data. I usually write this information down as it may be helpful if this proves to be an intermittent code. Intermittent codes can be more difficult to diagnose. If the P0130 immediately resets, upon removing the scanner and restarting the engine, suspect a power supply (to the O2 sensor/s) malfunction. Some automakers utilize a fused circuit to supply the O2 sensor system with voltage. Consult the wiring diagram (for your vehicle) to see if there is a fuse for the O2 sensors. Use the DVOM or a test light to test fuses and replace blown fuses as required. If there is a blown fuse, the likelihood that a sensor or sensor circuit is shorted is very great. If all fuses are in good working order (or there is no fuse for the O2 sensor system), locate the upstream O2 sensor for engine bank one. In some cases, the vehicle will need to be raised on a suitable hoist or jacked up and secured on safety stands. Once you have gained access to the sensor in question, unplug the harness connector and place the key in the ON position. You are looking for battery voltage to the sensor. The wiring diagram will show which circuit is used to supply battery voltage. Check for a system ground at this time, as well. If system voltage and ground signals are in order, reconnect the O2 sensor. Start the engine and allow it to idle (with the transmission in neutral or park). Use the scanner to observe O2 sensor input data. Narrow the scope of the data stream to include only pertinent data and you will get a faster data response. Assuming that the engine is running efficiently, upstream O2 sensors that fail to cycle from rich to lean (and vice versa) regularly with the PCM in closed loop are defective and must be replaced. Great work Mr Darby and thank you so much….